So the bass is finally done and it sounds amazing! When I first found this bass at Axe Music, it shocked me at how much better it sounded (and how much better it played) than other basses priced five times as much. And now, it’s definitely too nice to consider a "beater bass" for sure – it’s come a long way! First, I pulled out the frets and filled the spaces with wood filler. Thanks to the dark "chocolate" colored wood filler and the dying process that followed, the fret lines are barely visible and there is virtually no splintering visible. The black-dyed rosewood fingerboard was covered with clear epoxy and sanded down to make sure the fingerboard was perfectly level (no low spots, no high spots, etc.). The glossy glass-like finish was restored using micro-mesh sanding pads. 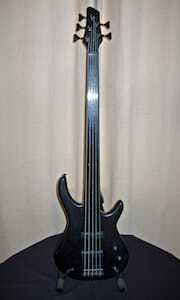 The neck was sanded down to make it slimmer and reshaped slightly to make it more comfortable to play. it’s now a very comfortable, fast-feeling neck. The thick finish and paint were stripped off the body – you can now hear the wood and the bass sounds much less compressed – it can breathe! 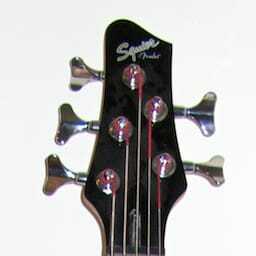 The body was reshaped slightly to allow easier access to the upper frets as well as to round out the edges. The body and neck were dyed transparent black (you can see the grain of the wood through the dye) and topped with a very thin coat of urethane that was buffed to create a soft-looking matte finish. The tuners were replaced with lightweight Gotoh GB7 tuners so the neck feels more balanced with the body now. The other hardware parts (bridge, strap pins, neck screws, etc.) were dry filmed black and they look amazing. Much more durable than any spray paint, and now they’re protected against rust, corrosion, abrasion, etc. too! Did I mention how good they look? The electronics cavity was shielded, the pots were cleaned and re-soldered and the bridge is also grounded much better now. The knobs were changed to rubber grip knobs – they not only look and feel nice, but it’s also a lot easier to finely control the volume and tone now too. In retrospect, I’m really glad that I couldn’t get the bridge I ordered from AllParts. Dry filming this bridge was definitely the way to go (even though it cost more than a replacement bridge) since I was able to keep the same string spacing as well as the same lightweight bridge. The bridge looks like any new black bridge you’d buy in a store – I was pleasantly surprised at the results I got from the dry filming company. I decided not to share an audio sample of the bass, mostly because of time constraints, but also because I didn’t want to influence people’s buying decisions with my playing nor my choice of what to record… (But mostly time constraints…) Plus, the bass really does need to be heard in person – it sounds big and tight and aggressive! Surprisingly so. Fretless Bass Conversion… Part V (Final) was published on Wednesday, May 27, 2009 at 1:10pm MDT by Daniel Menjívar and last updated on April 11, 2018 at 9:30pm UTC .